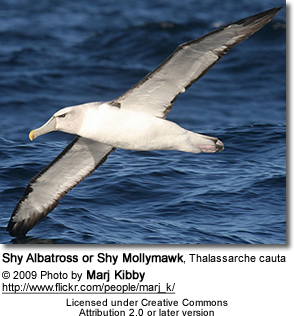 The Shy Albatross or Shy Mollymawk, Thalassarche cauta, is a medium sized albatross that breeds off Australia and New Zealand's sub-Antarctic islands and ranges extensively across the Southern Ocean. Some authorities call this species the White-capped Albatross. The Shy Albatross averages 90 to 99 centimetres (35–39 in) in length, 220–256 cm (87–100 in) wingspan, and 4.1 kg (9.0 lb) in weight. It is a black white and slate-grey bird with the characteristic black thumb mark at the base of the leading edge of the underwing. Adults have a white forehead and a crown, which is bordered on the bottom with a dark eyebrow and pale-grey face. Its mantle, tail, and upperwing are grey-black, and the rest is white. Its bill is grey-yellow with a prominent yellow culmen (= external ridge along the outer part of the centre of the upper bille, formed where the two halves of the mandible join) and yellow tip. The Shy Albatross is endemic to Australia and it breeds on three island colonies; Albatross Island, Pedra Branca, and the Mewstone. During the breeding season, adults concentrate around southern Australia and Tasmania. Juvenile birds are known to fly as far as South Africa; otherwise, non-breeding birds can be found throughout the southern oceans, but specifics are hard due to their similarity to the other species. It is sometimes found off the Pacific coast of the United States. The Shy Albatross breeds on rocky islands and build a mounded nest of soil, grass, and roots. They lay one egg in the second half of September. The Shy Albatross feeds by a combination surface-seizing and some pursuit diving - it has been recorded diving as deep as 5 m (16 ft). Fish, cephalapods, crustacea, and tunicates are the subsistence for this species. The IUCN classifies this species as Near Threatened, with an occurrence range of 23,900,000 km2 (9,200,000 sq mi). The population from an estimate in 2007 is 25,500 breeding birds with 5,100 pairs on Albatross Island (Tasmania), 270 pairs on Pedra Branca (Tasmania), and 7,380 on the Mewstone. Historically, they were exploited for their feathers and by 1909, there were only 300 pairs left on Albatross Island. Today, longline fishing still impacts this species but their numbers are maintaining through this threat. They also have had an avian pox outbreak on Albatross Island that has impacted their numbers slightly. Finally, the Australasian Gannet, Morus serrator is the primary threat to their survival. 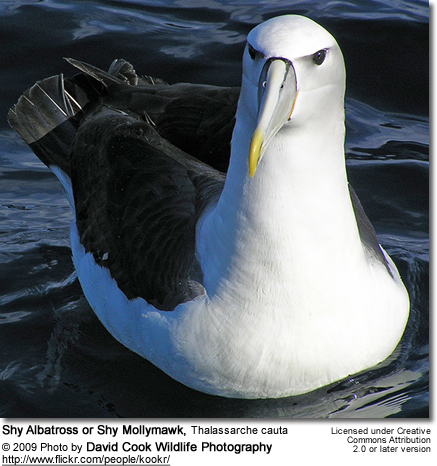 This mollymawk was once considered to be the same species as the Salvin's Albatross, Thalassarche salvini and the Chatham Albatross, Thalassarche eremita, but they were split around 2004. 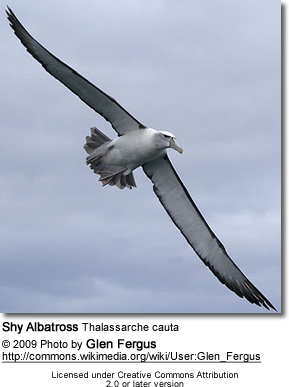 In 1998, Robertson and Nunn, suggested a four-way split including the White-capped Albatross, Thalassarche steadi. 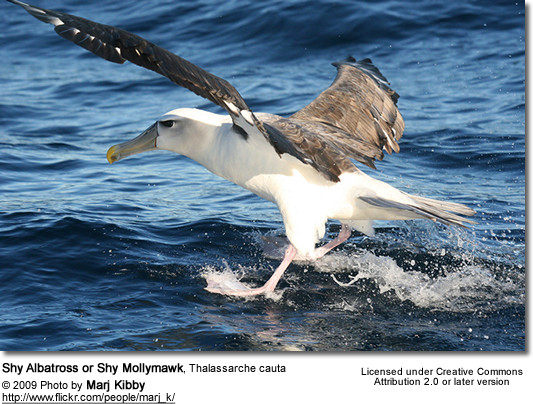 The three-way split was accepted by Brooke in 2004, the ACAP (Agreement on the Conservation of Albatrosses and Petrels) in 2006, American Ornithologists' Union (SACC) in 2008, and BirdLife International by 2000. James Clements seems to be the last major holdout on the three-way split. The fourth split, steadi, was only accepted by the ACAP (Agreement on the Conservation of Albatrosses and Petrels) in 2006, and BirdLife International in 2008. Finally, following Brooke, this species was shifted from Diomedea to Thalassarche, which was generally agreed upon by most experts. 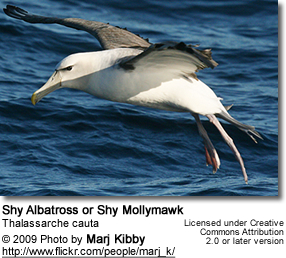 Mollymawks are a type of Albatross that belong to Diomedeidae family and come from the Procellariiformes order, along with Shearwaters, Fulmars, Storm-petrels and Diving-petrels. They share certain identifying features. First, they have nasal passages that attach to the upper bill called naricorns. Although the nostrils on the Albatross are on the sides of the bill. The bills of Procellariiformes are also unique in that they are split into between 7 and 9 horny plates. Finally, they produce a stomach oil made up of wax esters and triglycerides that is stored in the proventriculus (stomach). This is used against predators as well as an energy rich food source for chicks and for the adults during their long flights. They also have a salt gland that is situated above the nasal passage and helps desalinate their bodies, due to the high amount of ocean water that they imbibe. It excretes a high saline solution from their nose.